Need to model complex math and science concepts for your students? Use any of the 130 award-winning PhET math and science interactive simulations. Available for grades three through adult learners, these are open educational resources (OERs), which means they are free to use. Each simulation will work on any device, making it perfect for 1:1 and BYOD classrooms, as well as those with only teacher projection. Each PhET lesson (e.g. 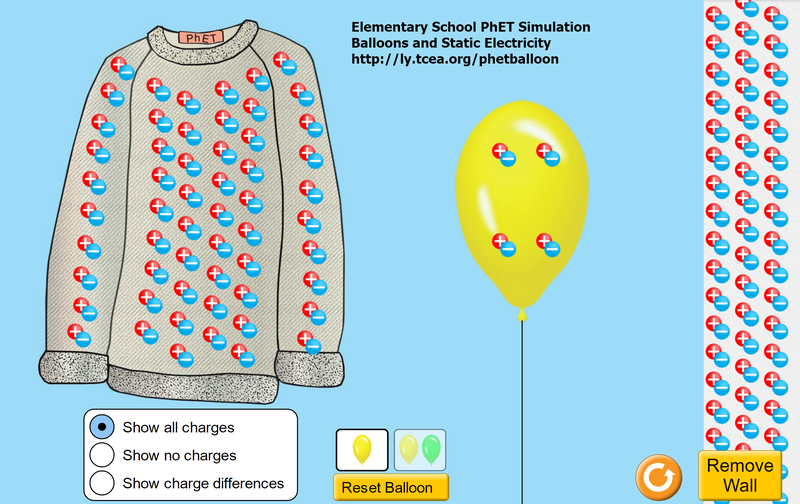 Balloons and Static Electricity simulation) comes replete with resources. Included are a video primer, lesson ideas, and teacher-submitted activities. Watch this video for an overview. A main goal of PhET is to assist students in becoming scientists. As learner-in-chief in their classroom, teachers ask questions (combine them with Quizziz or Kahoot for quick assessment) to highlight key concepts and spur deeper inquiry. Combine PhET and Office Mix to further support student learning. Explore a friction simulation. This can help students see what factors affect friction. Students can then respond to multiple choice questions which are placed in a Powerpoint slide show using Office Mix. Did you know? You can learn how to blend technology into instruction. Schedule an online or face-to-face professional learning session with TCEA’s Microsoft Innovative Education (MIE) Certified Trainers and Experts. Deepen reflective interactions focused on a simulation with video. Use Flipgrid.com to posevideo questions about a simulation’s key concepts. Students respond via their mobile device’s built-in video camera. These approaches and technologies are so easy, you can get going quickly. Select your interactive simulation and scaffold the inquiry with POGIL. Then, assess learning with Office Mix, Quizizz/Kahoot, and Flipgrid. Your students will be thrilled you made the effort!